The Sun and Moon will be on 13°40′ of Scorpio,this Water Sign’s second Decan (10 degrees) of Pisces, more flexible and inclusive than the first Decan. The New Moon in Eastern Australia coincides with a turn of the zodiacal wheel, the Rising Sign, at the exact time of the New Moon, passing from Pisces to Aries, from ends to beginnings. 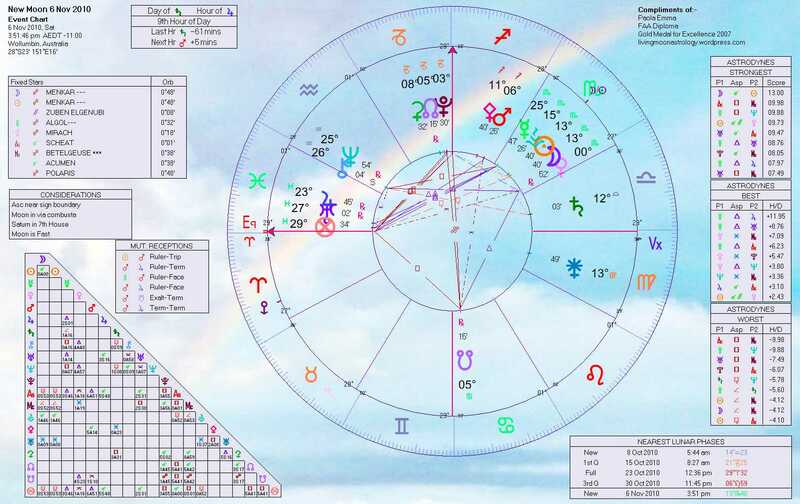 So there are three aspects emphasizing a new start in this Chart: the New Moon, of course, the change in the Ascending Sign, and the fact that this is Aries, the archetypal first! Every year, in October or November, we experience a New Moon in Scorpio, symbolically the start of a new astrological year for all Scorpios. In this case, this will be more so for those Scorpio born individuals whose birthday is today, November 6, or in the next two to three days. And also everyone who has the Moon, the Ascendant or other planets (the closer ones to Earth especially) around the Scorpio degree occupied by the Sun and Moon at New Moon. For those who celebrate their birthday now, the invigorating and stimulating effect of this New Moon will extend not just to the end of this lunar month but cover the whole year ahead. Only an accurate delineation of your Solar Return, the exact time every year the Sun returns to the same degree and minute he was occupying at birth, can tell you how close your birthday will be to this New Moon, what aspects were exact at the time, and what Signs were rising or setting for you. The Solar Return is in fact your true birthday, based on astronomical facts rather than a date on the calendar. It may fall on your birthday, the day before or after, it depends. Knowing the time of birth, at least approximately, would be necessary to calculate your Solar Return. With the New Moon close to your birthday you can expect life to present new openings, to offer novel opportunities, to push you into new directions and a new start, especially if the old life has not fulfilled your expectations so far. There is an undeniable new impetus at the New Moon, fresh energy and dreams, but also a degree of naivety and unpreparedness. Life beacons, but we may still be in the dark about our direction. At New Moon the Moon start waxing, slowly separating from the Sun and beginning to reflect his light back to us on Earth. But at first the waxing is kept secret because the Moon has not gathered yet enough light to illumine clearly our goals and the path ahead. So these are tentative beginnings, that may even look as false starts sometimes. You are being encouraged in the right direction, toward more light and more awareness, but it will take some time to see the tangible results of this change. For everyone else the Scorpio New Moon is always a wonderful opportunity to assess our priorities and be very ruthless at ridding our life of all the things that have passed their use by date, all the things, as well as feelings, relationships, jobs, etc., that fail to pass the following test: are you a vital part of my life? Are you emotionally enriching my life or not? Am I true to myself by continuing with my old ways or I should bravely venture to the depth of aloneness or intimacy, both rather scary places for most? The only way to decide which area of your life the New Moon will influence and if it will be forming any transits with your Birth planets, you need to know the basic layout of your Birth Chart. 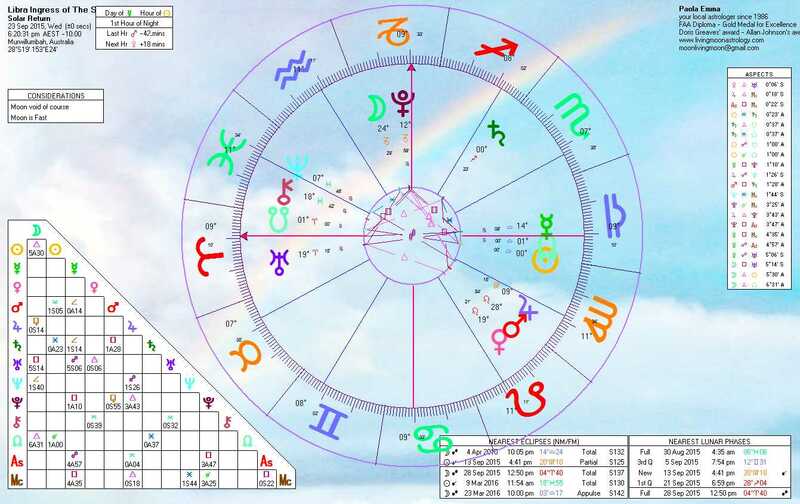 Rainbow editions of your Birth Chart, Return and Progressed Charts etc, can be ordered here. So, it was Full Moon yesterday. No one should have missed out. Some potent feelings were around and the strong desire to share them. It felt positive to me, but it might as well have been too full on for other people. Sharing the experience we have at a Full Moon can give us a glimpse of what we really mean by Astrology, the living reality of it. Life was too full and interesting for me to find time to post! You probably didn’t have much time to search the net either. Today we may start to integrate the experience of the Full Moon, always a revelation of sort, a climax, a realization that should encourage us on the inward journey the darkening fortnight is now bringing. The symbol I see on the cusp Aries-Taurus (29°32′) is that of a seed, a concept, an idea, an inspiration beginning to take concrete form, grounding itself in the fertile soil of our everyday reality. The Moon in Aries is like a spark, a stimulus toward action but still in need of a vehicle through which to manifest itself. Taurus represents just such a vehicle. The capacity for our ideas to find a suitable form and become reality have been part of the realization and vision contained in this special Full Moon. More of this kind, I mean Full Moons on the cusp between Signs, occurred this year already, see the September Full Moon with the Moon at Aries 0°15. And more will follow, see the November 22 Full Moon on the cusp Taurus-Gemini and the Total Lunar Eclipse Full Moon on December 21, on the cusp Sagittarius-Capricorn. On October 23 the Sun, just eleven hours after the Full Moon, also entered a new Sign, on the opposite side of the wheel, from Libra to Scorpio. There are now five bodies in Scorpio, Sun, Mercury, Venus and Mars, plus the asteroid Vesta (or Hestia). This passage promises eventful times for all people who have Scorpio highlighted in their Birth Charts, and to a lesser degree also Taurus, Leo and Aquarius (the other Fixed Signs), as well as Cancer and Pisces (the other Water Signs). Mars will leave Scorpio soon, on October 28. Hopefully we have used his energy wisely, in the last one and half months, to cut those ties that bind, to be strong in our feelings and personal truths, more honest with ourselves and others. Mars should now leave us with the desire to move on from here, to bigger and better things, from a deeply personal level to an impersonal and far-reaching one (Sagittarius Mars, October 28 to December 8). Mercury, who entered the Sign on October 21, will exit on November 9. The Scorpio Mercury’s period is not for the faint-hearted. We need to accept levels of thoughts that we usually avoid because the depth scares us or because of the need to face those sides of ourselves we find difficult to own. Hopefully we will not be too tempted to dump our negative thoughts onto others, becoming judgmental and cynical. This is an ideal period for any type of research or in depth study, for investigating occult phenomena and the working of the unconscious in our daily lives. On October 25 Mercury will become conjunct to Venus retrograding in Scorpio, an aspect full of poetry and creativity, when deep emotions can find adequate expression in words, and like minds meet. On a more material level the encounter of Mercury, the God of Business and Trade, and Venus, the Goddess of Wealth and Pleasure, could encourage successful business transactions, buying and selling in general. 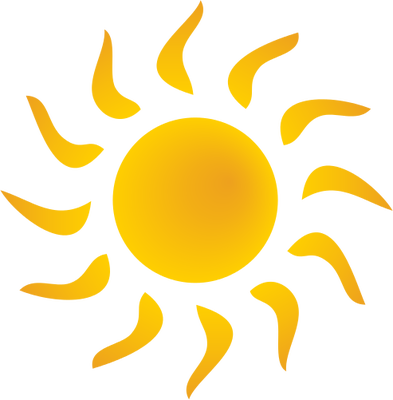 The Sun will be in Scorpio between October 23 and November 22. I am preparing at present some general readings describing the effect over the coming year of the transiting Moon on your birthday or Solar Return day. You will be able to access this information each day of the year. Venus is slowly retracing her steps toward Libra, re-entering Libra on November 8, then turning Direct on November 19 and re-entering Scorpio on November 28, until early January 2011! 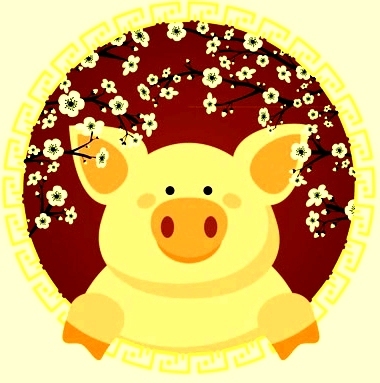 As I said in my previous posts on the long transit and retrogradation of Venus in Scorpio the Venus in Scorpio period, and even more so when Venus is retrograde in this Sign, is one when we will feel like seriously assessing or re-assessing our value system, sifting the wheat from the chaff, as the Bible says. What is fundamentally important will take precedence over momentary fads or fleeting desires. We are now on our way to discover, or more likely re-discover those activities, people and relationships which really count in our life and are vital to our emotional survival. We need to go through the confrontations and emotional turmoil of Scorpio in order to liberate ourselves from what of the past does not serve anymore as soul-enhancing role, to then enter the lighter, more adventurous and future oriented Sign of Sagittarius. Finally Vesta entered Scorpio on October 9 and will leave this Sign on December 5. Vesta is presently conjunct Venus, for a couple of days, making the present time also ideal to honor the sacredness of our love life, our family and more intimate relationships. Vesta in fact was in ancient times the Goddess and she is today the archetype of the sacredness of heart and family, the one whose role is to keep the family and heart’s sacred flame for ever alive. These different time-frames show how Scorpio in particular and all the Fixed and Water Signs in general are being stimulated mentally (Mercury), physically (Mars), emotionally (Venus), energetically (Sun) and spiritually (Vesta) by the present transits. Today, October 24, the Moon is transiting Taurus, stimulating the Scorpio energy via opposition. Yesterday the Moon opposed the Sun and Mercury, today is Venus and Vesta’s turn and tomorrow will be Mars. Avoiding the astrological cliche that oppositions are simply aspects of antagonism and strife (that, of course, they can often be), these transits are here to show us the other side of any issue or question, the point of view that can complete and enrich our, rather than be unproductively biased against it. Today the Moon in Aquarius is making contact with many planetary energies, Venus and Mars in Scorpio, Uranus in Pisces, Pluto in Capricorn, and also with the Lunar Nodes in Capricorn and Cancer. This is a strange mix, stressing the polarity of passion (Scorpio-Pluto) and dispassion (Aquarius-Uranus), total emotional involvement and detachment. This could be a great Moon energy to attempt to understand and verbalize those feelings which we usually keep private and unexplored, often dominating our unconscious reactions without being recognized by the conscious mind. Aquarius is an apt vehicle for the passing on and exchange of knowledge. This Fixed Air Sign shows sincere interest in understanding what’s going on, and it is focused enough to penetrate, at least at the intellectual level, beyond the surface of things, where lays the realm of Scorpio and Pluto. If used creatively these transits could help us to articulate well those flights of the imagination and subtle emotions that often remain inchoate and inaccessible; ideal for creative writing, psychological investigations and high and deep conversations, bridging the gap between rational and irrational. Of course these disparate energies could also be extremely difficult to reconcile, because the function of Air and Water in Astrology are fundamentally different, Air providing clarity, intellectual understanding and communication, while Water deals with emotions, non verbal communication and all intuitive connections.